-This condo in Emiliano Zapata, an area that is very popular in Puerto Vallarta. -This condo has a lot to offer to you so you can have the time of your life. -This 1 bed room 2 bathroom condo will make you relax instantly. -The bed room comes with a king rise bed, an A/C, celling fan, a closet, bathroom and a balcony. -The kitchen has every utensil you could need to cook a meal of your preference, it includes a dish washer, a microwave, an oven, a stove and it has granite countertops. -The dinning table has space not only for you, invite your friend’s and family over and show of your cooking skills. -The living room has a sofa and a flatscreen TV . -This is the place for you. Just wander along the main streets but check out the streets further away from the beach. Lots of interesting stores and places for a drink or eat. One of the most well known places to go to eat is “Fredy’s toucans” one of the best reviewed restaurant’s in Puerto Vallarta. At night is even more beautiful, you get to see all of the beautiful light that decorate the whole place, just take your time to explore the area and we reassure you that you’ll be pleased. Building Features - Garbage Chute - Elevator - Block & concrete walls throughout (sheet rock only in ceilings) - Security with TV cameras and controlled access - Water purification system - On site security - Free WIFI (Lobby/Courtyard) - Entry Intercom V177 lies in the heart of Zona Romantica in Puerto Vallarta. Great and spacious appartment. Very clean, large tv, AC and fan. Has everything I needed. Great pool! Easy and fast communication with concierge. Using AC only by night, cost were usd 26 per month. It's pretty much a guy place, if you have a problem with that I wouldnt recommend it. Otherwise I can totally recommend this place! -Check Out is at 10:00 AM. -The electricity isn't included from May 1st - Oct 31st. In order to avoid abuse of A/C a reading of electric meter will be taken upon check-in and check out to calculate the cost of electricity. -Late Check In: A fee of $25 USD will be charged for any check in after 6pm, this a has to be paid in cash upon arrival. Please make an accurate description of the number of staying. Any smoking damage,Pee on the bed and floor. Departure without turning off the power switches, such as the room lights, air-con etc. 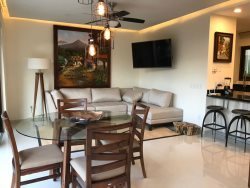 The Luxury Condo V177 Romantic Zone, located just a few steps from Playa de los Muertos in Puerto Vallarta, offers a common infinity pool and hydromassage tub. The elegant self-catering apartments have a balcony with sea views.